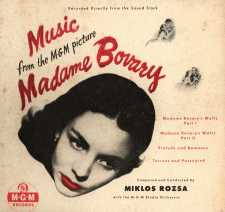 FSM presents the Miklós Rózsa Treasury (1949-1968), a 15CD set celebrating one of the giants of film music. 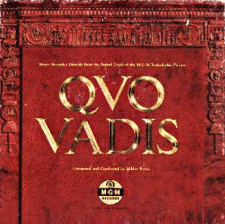 In this single package FSM makes available virtually every surviving, as-yet-unreleased note from the composer’s fertile and productive association with M-G-M.
At the core of the set are the first-ever complete releases of Madame Bovary and Quo Vadis (reconstructed with sound effects in some cues), two of the most sought-after titles in the composer’s filmography. 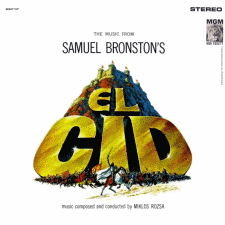 Scores that have previously circulated in pirate editions—Young Bess, The Story of Three Loves and All the Brothers Were Valiant—are included with professional mastering and comprehensive bonus tracks. There are also complete (or near-complete) scores that have never appeared in any prior format, such as The Light Touch, Crisis, The Asphalt Jungle, Tip on a Dead Jockey, Something of Value and Crest of the Wave, plus surviving cues from The Red Danube, The Miniver Story and East Side, West Side. All this—and more: the U.K. recording of Knights of the Round Table is included for the first time complete (an abridged version was released by Varèse Sarabande), and Rózsa’s (uncredited) contribution to Beau Brummell is presented alongside the full original score by Richard Addinsell. Extensive bonus tracks throughout the set shed light on both the filmmaking and composing processes, allowing fans to see how certain ideas were developed and changed over time. The Treasury “closes the book” on previous FSM releases Knights of the Round Table and Lust for Life with additional bonus tracks; and also includes bonus tracks from King of Kings and Ivanhoe for which there was not room on their earlier Rhino editions. 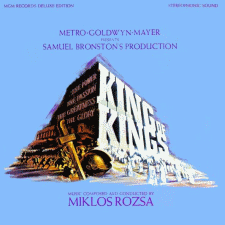 This amazing set also makes available several score re-recordings conducted by Rózsa himself, including El Cid, The V.I.P.s and the first genuine stereo CD release of King of Kings. 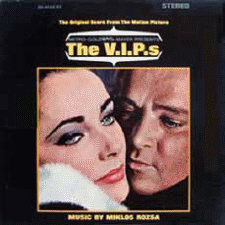 And for the first time ever on CD, listeners can hear the “greatest hits” album Rózsa recorded for MGM Records in 1963: Great Movie Themes Composed by Miklós Rózsa. Crowning this magnificent achievement is the premiere release of the complete score to The Power—previously available only in abridged form, now with extensive bonus tracks and mastered for the first time from the (newly discovered) original 35mm scoring masters. The three clamshell cases come in a deluxe box with a 48-page booklet containing a short essay and complete track listings. Online you will find free extensive notes in the finest FSM tradition by FSM regulars Lukas Kendall and Al Kaplan, plus Rózsa Society members Frank K. DeWald and John Fitzpatrick. There are also original LP notes and a few surprises. This is a set to be loved and cherished by Rozsaphiles past, present and future. With only 2,000 being pressed, it is sure to become a collector’s item. I just got this from my folks for my birthday. I don't even know where to start! First disc I listened to was "The Power" and it's so much clearer and more dynamic than the previous versions. What an amazing set. Yes, but did ANOTHER thread have to be started (again) for this box? Unfortunately he has THE POWER. This one's so much easier to scroll through and weed out what you don't want to read. This thread should work perfectly until it gets to be too long, and then I hope somebody starts a new thread about the same subject. I'll be anxious to check that one out, too! THE POWER is frickin' awesome. Also was the first thing I listened to (was so disappointed originally when it seemed the "private" program was all that survived). Thank God the original tracks were found. Well, technically I didn't create this thread, I found it at the bottom of the SAE product description for the Rozsa Box and when I did a search for threads, I only came up with the one complaining about sound quality on one of the discs, which I didn't want to contribute to. I was surprised to be the first one to comment on the "official" thread about this awesome set. Yes, the Power is stellar - I already owned the previous FSM version but I wanted this box of course for all the other great scores on there as well. My Dad was cool enough to get this for me for my birthday last saturday. He was like: "I knew you liked Goldsmith, but who's this guy?" Though impressive and satisfying as a whole I am quite partial to the alternates from King Of Kings. The set is worth the price for The Power alone, and I haven't ordere it yet. See online liner notes for detailed track lists and selected audio samples (click on red track titles for MP3 sound clip).